Irish vet Noel Fitzpatrick, who hosts Supervet on Channel 4, came to the rescue of a distressed swan on a rain-washed, traffic-choked Dublin street on Tuesday afternoon. The 50-year-old vet, who has rescued a number of swans over the years, was on the way to RTÉ to do an interview with Ray D'Arcy on RTÉ Radio One when he spotted the swan on the main Donnybrook road. After coming to the confused bird's aid and delivering it safely back into the nearby canal, he told Ray that the swan landed right in front of a taxi with trucks and a motorbike having to swerve out of its way. "Fortunately I had lovely tweed jacket that I had just done a television interview in and that was perfect for getting a swan safely under it and ran him back to the canal and released him." 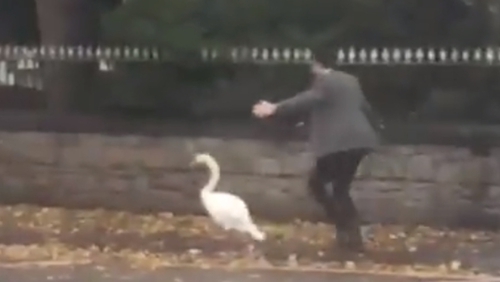 The Laois man got out of his car and chased the swan before wrapping it in his jacket and bringing it to water-borne safety, telling D'Arcy, "My wrist is killing me, he was huge!" He later tweeted, "On route to the next interview in Dublin this afternoon and we came across this poor confused fella who was stuck in the middle of the main road. Having experienced many Swan rescues down the years I knew I could help... mission accomplished...now happy and safe at home x"
Noel told Ray that he felt like he became Vetman, the imaginary superhero that features in his latest book. "We were rushing from Grafton Street down here and across the canal and a swan just mistook the road for the canal because it’s blizzarding rain down there," he said. "It just landed on the road right in front of a taxi cab and trucks were coming and bikes were swerving and I said ‘pull the car over!'"